Blake loves to build things and has many toys such as blocks, mega blocks and lego duplo to play with. 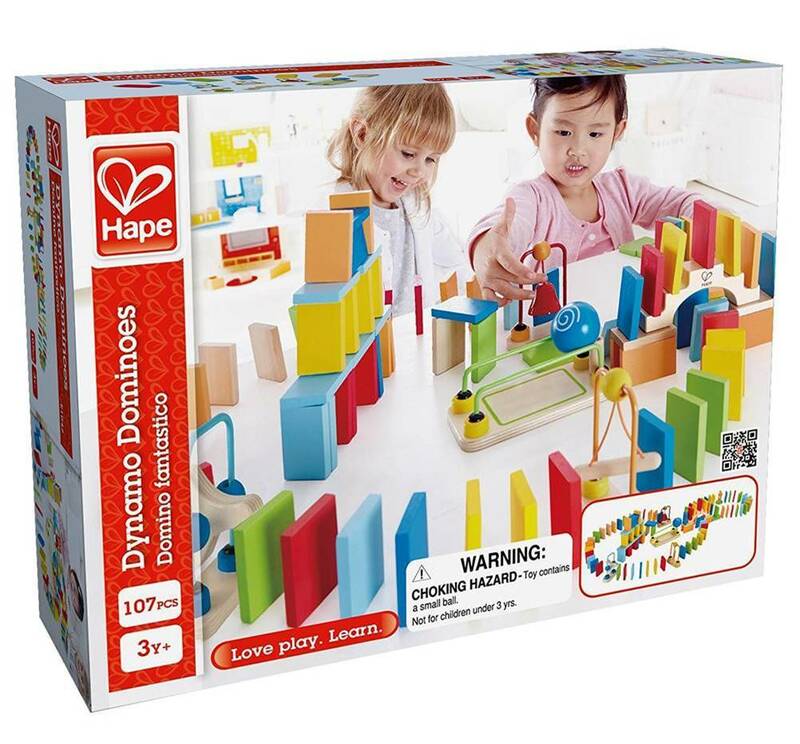 We love to spend time together building towers, airports, cars etc so when I was asked if I would like to review the Dynamo Dominoes set from Hape I thought it would be a fun set to play with together one weekend. Inside the box there are 107 pieces, 100 which are of bright and colourful domino pieces the rest of the set is made up of a bridge, bell, rail and assorted tricks. I was a bit worried about if it would be complicated to build with so many pieces, however as you can build different trails you have no need use all of the dominoes unless you want to. The set is aimed at children 3 years and over and we had lots of fun building different domino trails together. Blake loved seeing the dominoes tumbling down shouting "ready, steady, go!! "before he knocked them over, he was so proud of himself building different fun trails. The peices are a great size and ideal for small hands. The set is great for learning too as its helps children to develop their fine motor skills along with problem solving skills. Because you can build different trails this also helps with aiding children's imagination and is a toy that can be played with others so encourages turn taking and spending time with friends. We love the different little tricks as a way of keeping children entertained for longer. As usual with Hape toys they are of the highest quality and child safe. Overall this is a great toy that not only children will love but adults too.